Never cry over spilled milk – or when your dog goes astray at the National Dog Show. It’s not the end of the world forever. Like millions of Americans, I spent part of my Thanksgiving watching the National Dog Show. I don’t know why Thanksgiving and the National Dog Show have become a combined tradition – other than many of the dogs would love to tackle a turkey and turn it into a chew toy – but the two now go together annually. 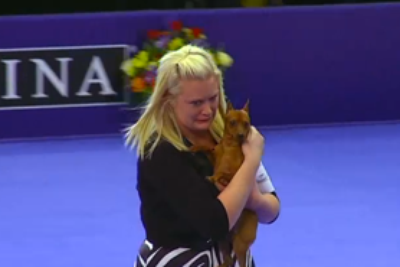 What I’ve concluded is that it should really be called the National People Show because the show dogs could care less. My English bulldog has some sort of award-winning pedigree, a name on her AKC registration so long that I truly don’t recall what it is. We just call her, Rosie the English Bulldog, and even then she rarely listens. My pedigree pup wants nothing to do with a show ring; rather, she wants to eat, sleep on “her” couch and poop in our hallway when no one’s looking. Basically, a $3,000 show dog is an arrogant, slovenly alien that dwells in your house. At least mine is. Yet, people are compelled to romp pampered pooches around a show ring on Thanksgiving Day – and we watch by the millions. However, this year was worth the spectral because as a miniature pinscher did what dogs do – playfully making a mad dash untethered across the ring – its frantic handler ran after it, swooping it up, all to the delight of viewers. It may not have been that big of deal, but the fact that the handler cried inconsolably while carrying the dog back and uttered, “My world is over forever,” made a lot of us wonder if she wasn’t the most vapid, self-absorbed individual in the world – forever! I mean, I know people take dog shows seriously, but what kind of person cries and declares that her world is over forever (which is redundant), because her happy dog went for a self-appointed stroll? All of this made me want to talk to the handler, literally. I had to know why she would take such a mundane – if not cute moment – and process it as a human tragedy? In all seriousness, I deal with individuals and families everyday who face devastating life circumstances – permanent disabilities, terminal illnesses, and the worst-of-the-worst, parents losing their children. And, so, in my world where children pass away at age 9 due to muscular dystrophy and mothers are paralyzed in their 40s due to ALS, how can anyone be so seemingly shallow, to be so clueless toward true human tragedy that she would sob and declare the end of her world over a happy dog trotting around a show ring? Yes, she lost a dog show, but the dog was happy, there was no consequence on anyone’s life whatsoever and, no, despite her declaration, the world didn’t end. Unfortunately, I wasn’t able to track her down. Nevertheless, there’re only two possible causes for the handler’s completely inappropriate reaction. The first is that there are other emotional and psychological factors in the handler’s life that came out upon the unrelated catalyst of the canine’s impromptu jaunt. Emotions have to come out eventually, and they can come out at unexpected, unrelated times. Maybe the handler has real issues in her life and they all manifested on the punch-drunk little pinscher. I can’t help but empathize for anyone in such a situation, where flood gates of emotion open at an unexpected time – it’s scary, isolating and, unfortunately, can feel mortifying. On the other hand, some people do live remarkably privileged, narcissistic lives, where the slightest hiccup – a lost dog show! – is the seeming end of their worlds forever. Maybe the handler truly is as shallow as she’s appeared. I have no idea where the handler’s life experience resides. However, given the two possibilities, I sincerely hope that her sobbing over a cantankerous canine was emblematic of a vapid narcissist because that’s a far better fate than those who’ve known true tragedies.